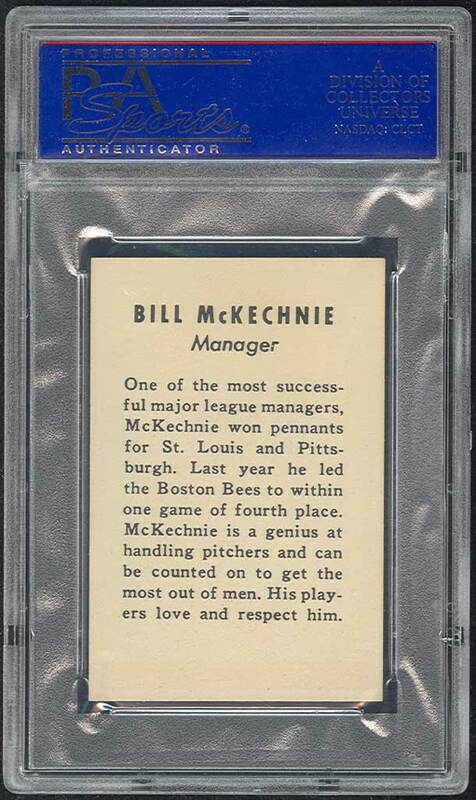 Bill McKechnie may have been the best-liked manager ever. 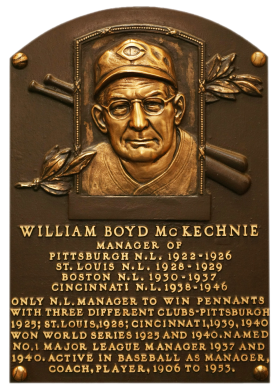 Winning pennants with three different teams, the gentlemanly McKechnie refuted Leo Durocher's "nice guys finish last" notion. "The Deacon's" best effort, though, might have been with the fifth-place 1937 Braves, enough to win the Manager of the Year award. He won two world championships and was 1,899-1,724 in 25 years. Comments: In October, 2003 I picked up a raw example of this card via eBay. I picked up another copy in March, 2005 with another eBay purchase. The first ended up grading PSA 3 and I sold it in June, 2005. The second graded EX-MT 6. In September, 2005 I found a raw example described NM for $30! I submitted this beauty to PSA at the National in 2006 and they slabbed it NM-MT 8. Trade show luck!!! I couldn't be happier, and remember smiling from ear to ear the entire weekend, and consider it one of my best purchases. I can't imagine finding a better example ever. It's the highest graded copy in existence. Great card! 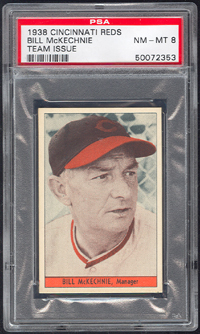 Description: This 32-card set is a challenge of particular interest to Cincinnati team collectors. 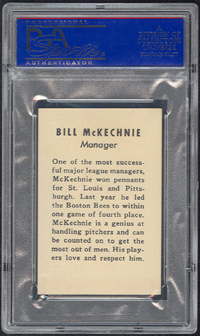 The 2" X 3" cards were sold as a boxed set at the ballpak. Fronts feature a black-and-white photo of the player while backs have the player's name, position and a generally flattering description of the player's talents. The cards are not numbered.